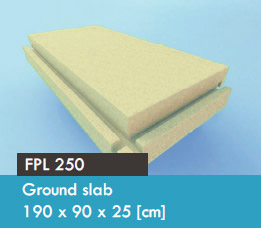 Ground slabs are the newest product offered by Izodom 2000 Polska and can be successfully used instead of traditional continuous strip footings and foundation walls. 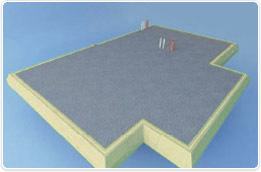 This is a concrete slab cast on the building site and reinforced with classic steel rods or steel fibre reinforcement. 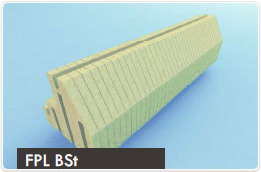 Basic formwork components produced by Izodom are used in its execution. These enable obtaining varied shapes of slabs - according to the design of the structure being built. 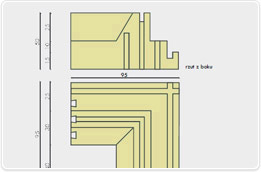 The designer must decide on the class of concrete and the quantity of steel fibre reinforcement. The thickness of the ground slab is 25 cm. In exceptional cases, at the designer’s request - it is possible to increase the thickness to as much as 40 cm, by using a special plate increasing the height of the edge component - and so increasing the thickness of the reinforced concrete slab. 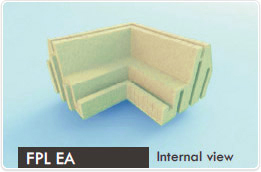 The thickness of the insulation may be increased by successively 6, 8, 10 or 12 cm using auxiliary ground slabs. 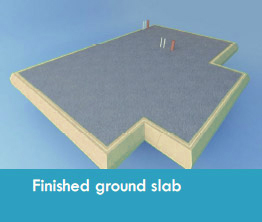 Additionally, slabs may be advanced beyond the external contour of the ground slab to a distance of approximately 1.5 metre in order to ensure protection against the possibility of ground freezing beneath the ground slab. 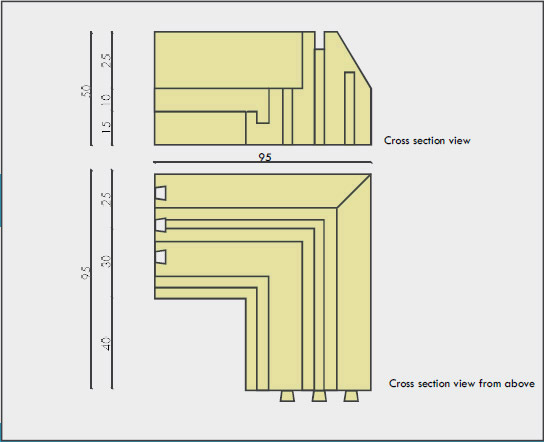 Thanks to the components being made in a mould, they have precise and repeatable dimensions, and their assembly is simple and quick. The ground slab is a monolithic component, much more stable than the presently used continuous strip footings and foundation walls. 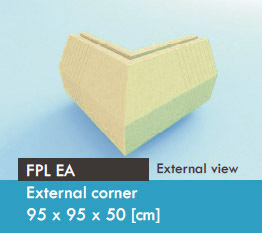 Easier thermal and damp protection. 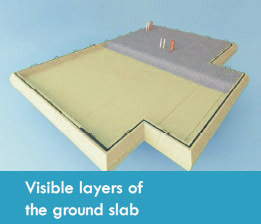 The ground slab is easier to insulate - there is no need for the additional vertical and horizontal insulation that is indispensable in case of traditional continuous strip footings and foundation walls. The ground slab is a component whose exceptionally simple construction excludes the possibility of making mistakes. Shallow location the ground slab. 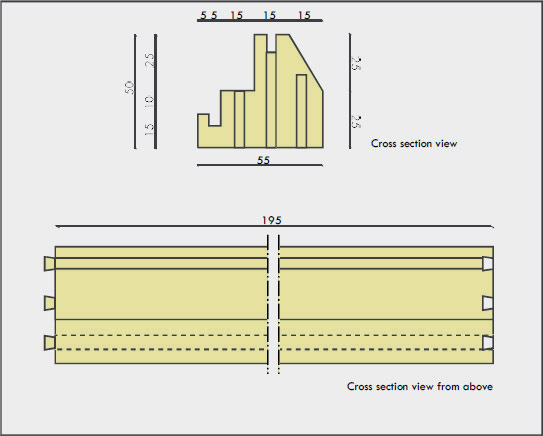 Thanks to the possibility of locating the slab at a depth of as little as 0.5 metre, it is possible to reduce the scope, time and cost of earthworks. 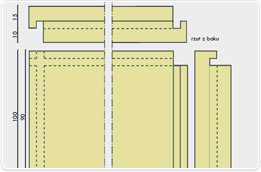 Simplified diagram of a ground slab built using Izodom 2000 Polska components. Ground slab 190 x 90 x 25 [cm]. 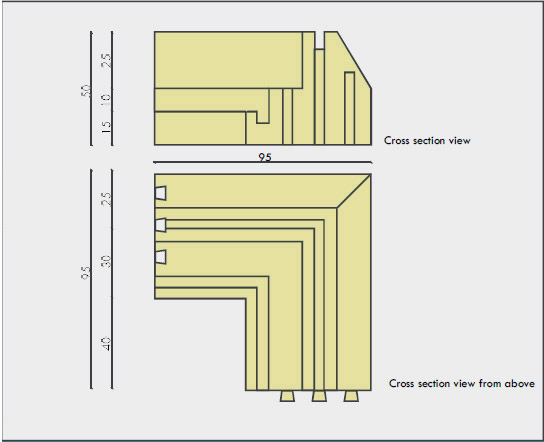 Ground slab - cross section view. Edge - external view 195 x 55 x 50 [cm]. Edge - internal view 195 x 55 x 50 [cm]. 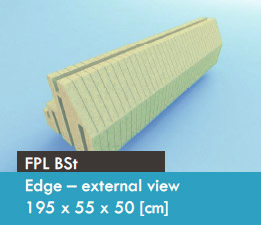 Edge - cross section view. 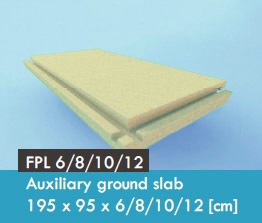 Auxiliary ground slab 195 x 95 x 6/8/10/12 [cm]. 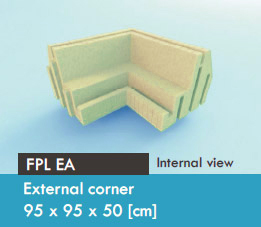 External corner - cross section view. 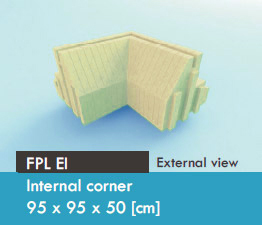 Internal corner - cross section view. 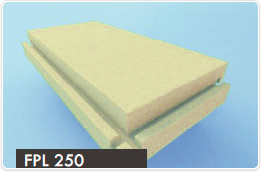 The components of the ground slab are made of peripor which features excellent insulating properties and at the same time is resistant to moisture and the effects of considerable external loads. 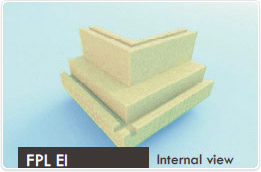 With its properties it equals the features characterizing foam components made of XPS. 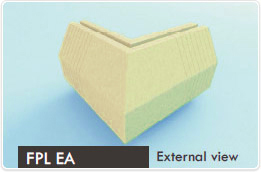 The highest quality of this material is guaranteed by BASF which is our sole supplier. 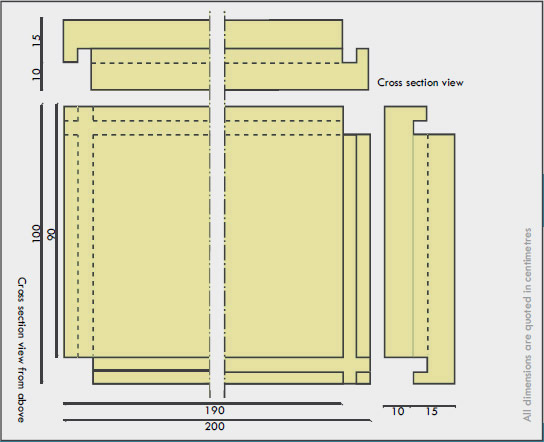 How do we build using ground slabs? 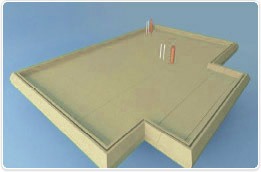 Building structures with the use of ground slab formwork components is a simple process and enables saving much time. Removal of the layer of humus and native soil to a depth in accordance with the documentation. The precise placement of water and drain installations and other media. Execution of these works requires care in order to avoid the need to reposition the already executed internal installations in the building at a later stage of construction. Using coarsegrained gravel or key aggregate, we form a compacted sand and gravel fill, arranging the material in layers, with every layer being exactly compacted. 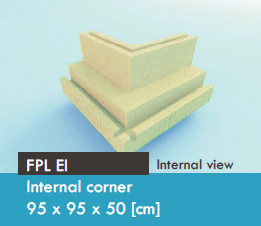 The recommended thickness of the compacted sand and gravel fill is 15-20 cm. Then on the top of the compacted sand and gravel fill we add a 3-4 cm thick compacted sand fill. After this sand has been evened out and compacted, we lay a damp insulation using 0.6 mm thick plastic sheet. We lay the edges of the plastic sheet on the slope of the compacted sand and gravel fill in order to ensure maximum protection of the slab against the negative effects of moisture. 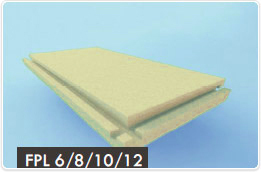 We erect the insulating formwork components in such a way as to obtain the required size and shape of slab. 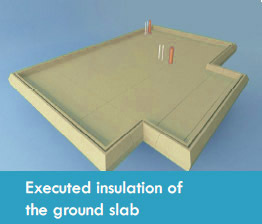 The shape of the slab is executed in a 5 cm module. 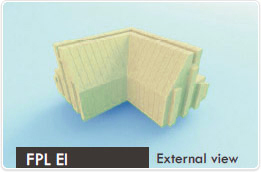 The bottom components are joined together and attached to one another with the edges by means of "interlocks". The edges are connected by means of "tongue and groove" type locks. In order to ensure the desired dimensions of the components, we cut them with a wood saw or a special thermal guillotine (offered by Izodom). We dig a circular drainage in the foundations excavation as near as possible to the lower edge of the compacted sand and gravel layer. 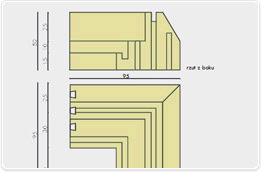 The diameter of the drainage pipes and the distance from the planned walls must be in accordance with the documentation. The drainage should be laid on the compacted sand fill and covered with gravel or coarse sand. We execute steel reinforcement of the slab - in accordance with the documentation. This may be traditional steel reinforcement in the form of wire mesh or else classic steel reinforcement in the form of steel rods, or a mixed solution using these two solutions. 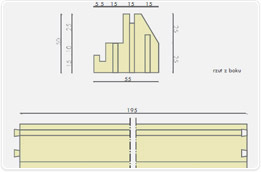 Rectangular channels are located on the horizontal edges of the formwork components, in which stiffening supports should be installed at the time of concrete pouring in the form of rectangular steel pipes (offered by Izodom). The aim of this solution is to eliminate any possible deformation of the formwork ensuing from the pressure of the poured concrete. 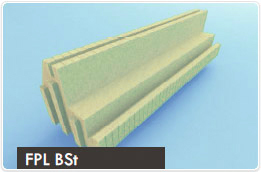 We fill the formwork with concrete of a suitable class and a suitable consistency. We fill in the crevices in which the steel stiffeners were placed with shaped pieces of insulating material offered by Izodom, these being cheaper than fitting foam. 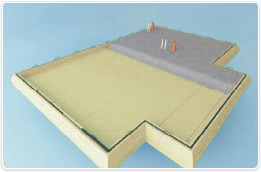 Executed insulation of the ground slab. Visible layers of the ground slab.